Martian Manhunter/Marvin The Martian Review: Isn't That Lovely? In the realm of Looney Tune antagonists, Marvin the Martian is something of an odd duck. While all of the other foes that Bugs Bunny has faced are fairly harmless, he's one of the only ones that can actually be considered a credible threat. Let's be honest, Elmer Fudd is a perpetually-clueless dope, and he's not even good at that. At times, you almost feel sorry for him. Yosemite Sam has more weapons and confidence, but he's easily tricked and almost all bluster. Marvin, on the other hand, can actually pose a very real danger to Bugs. I wouldn't go so far as to say that he projects an aura of menace, but there's a reason that so many entries into the franchise have positioned him as the villain. For the most part, he wants to commit genocide by destroying Earth for his own petty reasons, the most common of which is that it "obstructs his view of the planet Venus." He utterly enjoys hunting smaller creatures and mocks Earthlings for being primitive. He also has a soft-spoken and gentle nature, making the true nature of what he aims to do even more disturbing, as much as that word can be applied to a slapstick cartoon. With all of this in mind, it comes as no surprise that Steve Orlando and Frank J. Barbiere manage to turn what could be a ridiculously mismatched story into a touching cosmic tale. The heart of the crossover comes from Marvin and J'onn's shared Martian heritage. Despite having completely different views of society and coming from separate dimensions, they still share a bond, as slight as it may be. J'onn even pronounces Marvin's name in the distinct Martian dialect, trying to connect with him. I'm also glad that Aaron Lopresti kept Marvin's ant-like structure in the art. It enhances the contrast between Marvin's puny gladiator design and the Martian Manhunter's distinctly more humanoid look. If we ever get a DC Rebirth series starring J'onn, then I hope Steve and Aaron are retained as the official creative team. The story has an effective grasp on keeping the standard Looney Tunes comedy, while also portraying the humanity seen in J'onn's worldview. Even though the chaos caused by Marvin's actions cause the populace to mistrust him, he still puts his hope in the essential goodness of human nature. All the while, Marvin just has this smarmy tone of voice, and it fits with his character. In a way, he also does care about the Martian race, but he'll gladly prioritize them over others. One other thing that I really appreciate in the story is the inclusion of Area 52, where Marvin finds weapons to use against Earth. I'm fairly certain that it acts as a reference to the theatrical film Looney Tunes: Back In Action, where Marvin actually shows up in that government facility, later playing a key role in a spectacular joint Duck Dodgers/Star Wars homage. The short backup story features the standard Looney Tunes incarnation of the character and a stylized version of J'onn. It's a cute story and packs a lot of jokes into a small amount of pages. In a way, it's very similar to the main feature, but features more references to the cartoons, such as Marvin's assistant K-9 and Duck Dodgers cameos by way of shape-shifting. Plus, cookies! "Best Intentions" is written by Steve Orlando and Frank J. Frank J. Barbiere, drawn by Aaron Lopresti, inked by Jerome Moore, colored by Hi-Fi, and lettered by Carlos M. Mangual. "The (Next To The) Last Martian" is written by Jim Fanning, drawn by John Loter, and lettered by Saida Temofonte. 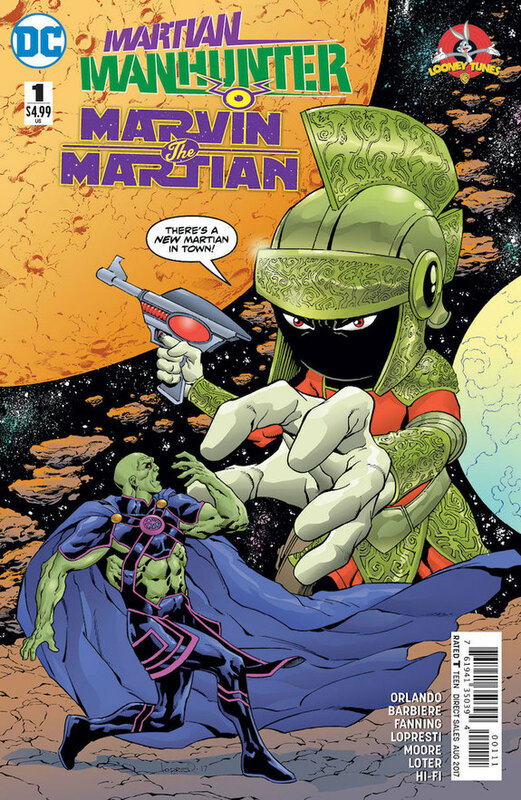 Martian Manhunter/Marvin The Martian is available at your local comic book shop.